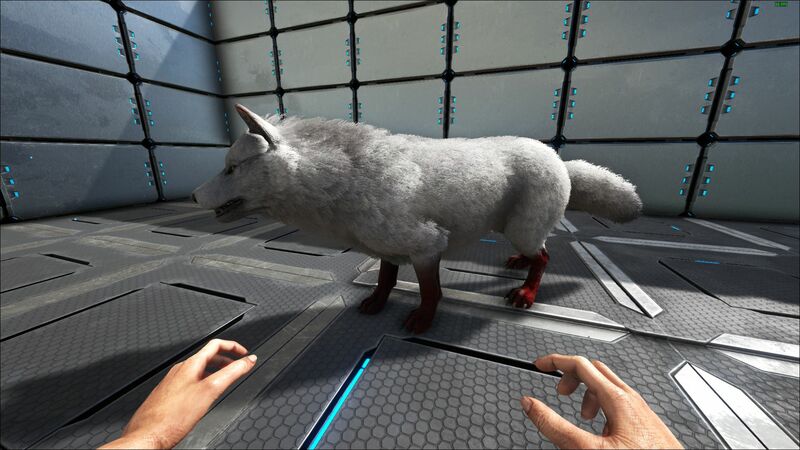 The Direwolf is one of the creatures in ARK: Survival Evolved. It lives in the Snow Biome and in some areas of desert on Scorched Earth and Ragnarok, though in lesser numbers. The best adjective to describe Canis maxdirus is "scary." This pack-animal is a cunning and brutal predator, capable of taking down prey of nearly any size. In addition to being a vicious hunter, it is the size of a small horse, meaning even the largest predators aren't necessarily safe from the packs. Unlike most creatures on the Island, Canis is a dedicated pack hunter, and rarely hunts alone. When in a pack, Canis are naturally spurred to fight for their lives with increased effectiveness, while the most experienced Canis will be designated “Alpha” and gain an even stronger enhancement! The species has an incredible affinity for teamwork. Obviously, Canis is a thrilling battle mount. It is fairly fast, very strong, and agile. It can leap almost as well as the Island's battle-cats. Riding a supercharged “Alpha” Canis into battle at the head of a bloodthirsty pack is a thrill for which most warriors would gladly proclaim: "today is a good day to die!" If utilized correctly, Canis can be a useful aid in your discovery efforts. It has developed a keen sense of smell that enables it to detect things that most creatures can't. I've even seen them used to find creatures that are hidden beneath the surface. Direwolves are large pack animals. If you see a Direwolf on its own, be sure to scan the area for the rest of its pack unless you want to become their prey. Being carnivorous pack animals, Direwolves will likely attack on sight, so caution is advised. However, they do have the capability of being tamed, and are extremely loyal mounts once they are. The Direwolf is the ancestor of the modern wolf. It has been modified for the dangerous environment of the ARKs, therefore making it a very large species. The Direwolf ranges anywhere from white to black, with mixed grays and blacks. The Direwolf is large and muscular. This section displays the Direwolf's natural colors and regions. 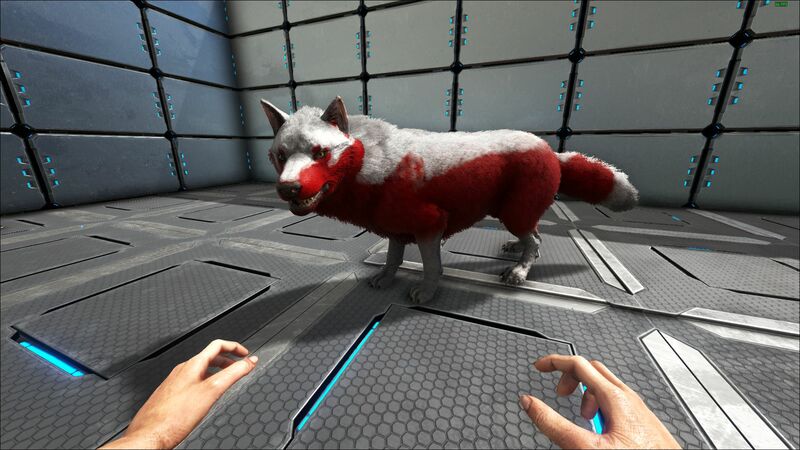 For demonstration, the regions below are colored red over an albino Direwolf. The colored squares shown underneath each region's description are the colors that the Direwolf will randomly spawn with to provide an overall range of its natural color scheme. Hover your cursor over a color to display its name and ID. 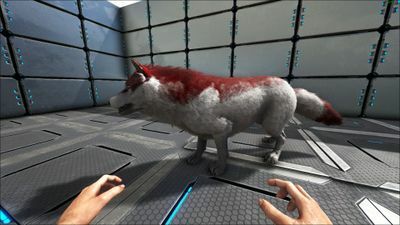 The chance of getting a wolf colored with DinoLightOrange is about 0.7% (1 out of 143) for each individual color region. 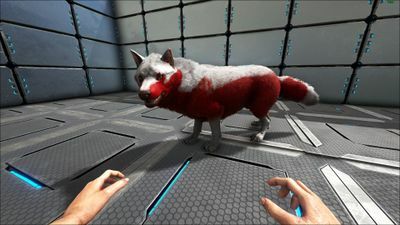 For example, "cheat SetTargetDinoColor 0 6" would color the Direwolf's "body" magenta. The Direwolf - LifesLabyrinth is a variant of Direwolf that can be found on the Ragnarok map as a dungeon boss in LifesLabyrinth. It will spawn in waves with the Direbear - LifesLabyrinth beginning at level 50, and increasing its level every wave by 50, ending at level 250. It is identical to the normal Direwolf in all aspects except for its ghost-like appearance. Using the (PC), (PS4), (Xbox One), the Direwolf bites the target. The Direwolf bites the target. This attack's values are only used by a wild or an unridden tamed creature only. They can be picked up by an Argentavis, making it easy to separate one from a pack and put it in a small box with windows to shoot arrows through. Lower Levels take 4-12 tranq arrows. Beware however, that unlike other dinos, the wolf can sometimes hit the bird that is carrying them, potentially killing it and its rider. To avoid this, drop the wolf and pick it up again until the angle and distance its held is safe for the Bird. Hitting the wolf once while carrying it will also usually move it into a position it can't attack the Argentavis. Another way is use a bola and just keep winding it up to stop as many as you need and just tranq it until the animal is unconscious. When in pack, the Direwolf will receive a pack bonus for each other pack member (up to a maximum of 4), indicated by a number present beneath their names (eg. "+2 for three Direwolves in the pack). Each Direwolf receives a 5% damage bonus for each other pack member. The highest level member of the pack doesn't receive a number and is instead classed as "Pack Leader", which on top of the damage bonus, grants access to the Howl ability using the alt-fire key/button. Once the Pack Leader has used the ability, all members of the pack receive a buff (either Pack Member or Pack Leader, respectively) for 90 seconds. The buff grants all members a 50% damage boost (this bonus is multiplicative, affecting all other damage boosts) and also a 25% damage reduction (also multiplicative). Once the buff has expired, the Pack Leader is unable to use the Howl ability again for another 90 seconds. This section describes how to fight against the Direwolf. In the snowy areas they inhabit, you will almost never find a Direwolf alone. This furthers the already frightening power of the beast and adds potential mate boosting to make matters worse. Whenever you fight Direwolves, also make sure you have slain the whole pack before turning your back, and packs of up to 3-5 are not uncommon in the snowy plains. If possible, keep distance from the Direwolf, and deal as much damage as possible during their aggro animation (which is long compared to a lot of smaller threats). A lone wolf or a few individuals of the pack can be effectively killed before they can reach you. Ranged weapons, particularly those that allow you to use a scope, are extremely effective. The snow biome is quite barren in many places which makes engaging from a range very safe and easy, providing you have the tools to do so. Bolas can also trap them, making an individual wolf easy to kill, and can buy a survivor time to deal with other Direwolves in the pack. Most are accompanied by packs or at least one other Direwolf. They are also quite fast over land and can close even large distances very swiftly. Don't get caught off-guard and keep your range and wits about you and you should survive most run-ins with the Direwolf. Direwolves move like molasses in water, which is good because the snow biome has handy ice floes for you to snipe from with safety. Use a rifle and put down the wolves before they can close distance and become a real threat. Direwolves also have a low health pool and are weak to knockback, so heavy mounts like the Spinosaur can easily deal with them without getting struck even once if the attacks are chained properly. Apart from howling to achieve alpha pack boost, Direwolf can also sniff out (once activating said ability) for both unopened explorer notes and buried/camouflaged dino like Purlovia, Basilisk, Reaper King and Rock Drake marked with a blue mask icon. Organic Polymer Farmer: Very efficient Organic Polymer harvesting abilities, it can be used to harvest a lot of Organic Polymer from Mantis, Kairuku, Hesperornis, etc. Wounded Finder: Smells for nearby wounded non-allied survivors and wild dinos (50% below health), perfect if the survivor or dino is hiding in areas not so easily detectable by naked eyes. While mounted Red (Very wounded), Yellow (Slightly wounded), Orange (Moderately wounded), and White (Deceased) health symbols will be displayed above Dinos. The dossier mentions an "Alpha Wolf", a feature that was not implemented when the wolf was released in version 216.0, and wasn't implemented until version 258.0. This stands in contrast to the Allosaurus, which had an "Alpha of the Pack" mechanic upon release in version 245.0. On Scorched Earth the direwolves spawn as single wolves since 258.3, "because with pack they were too strong there". Direwolves appear to take less fall damage than their Sabertooth counterparts, and they can fall from a greater height before sustaining fall damage at all. Direwolves have no access to any kind of armor. Only on Mobile they can wear helmets which make them an even better cave mount. Pressing alt-fire (default rmb) will make the wolf howl, making it easy to find home when you are lost and have a tribe. The Direwolf attack is very fast and can be devastating to prey and enemies. This makes the Direwolf a very powerful mount. In an interview, the developers said they may consider adding a saddle or some type of armor for the Direwolf. Real Direwolves were actually just bulkier and stronger versions of modern-day gray wolves, and would not have made very good mounts. Direwolves are the main danger of the Snow Cave, spawning at extremely high levels, sometimes up to 340. Domesticated direwolves appear to have a natural 40% damage reduction. Direwolf receives a major update for TLC Phase 1 at 10 February 2018 with appearance overhaul, changes into "Pack leader" buff, Hunter's instinct (detect living creature/survivors under 50% health), and ability to sniff for Explorer's Note. This page was last edited on 14 April 2019, at 20:58.